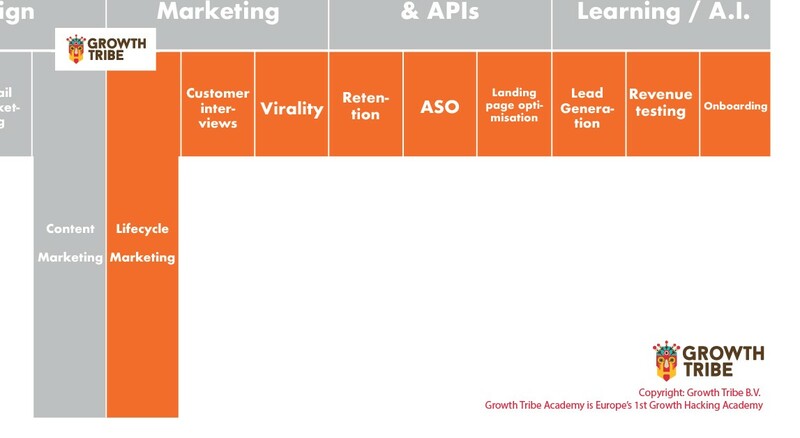 At Growth Tribe we teach data-driven marketing based on rapid experimentation. A mix of Behavioural psychology, Creative Marketing, Coding & automation, and Data and testing. If you’re a Marketer and/or a Product owner (or just alive and employed nowadays..) you need to be more technical, psychological and data-driven than ever before. Growth is so important it should be embedded in the DNA of your company (rather than applying a band-aid with consulting). One large issue when hiring is that many traditional universities fail to include the necessary skills in their curriculum (Did you learn about automation, about API’s, landing page optimisation, chatbots or web-scraping at uni?). 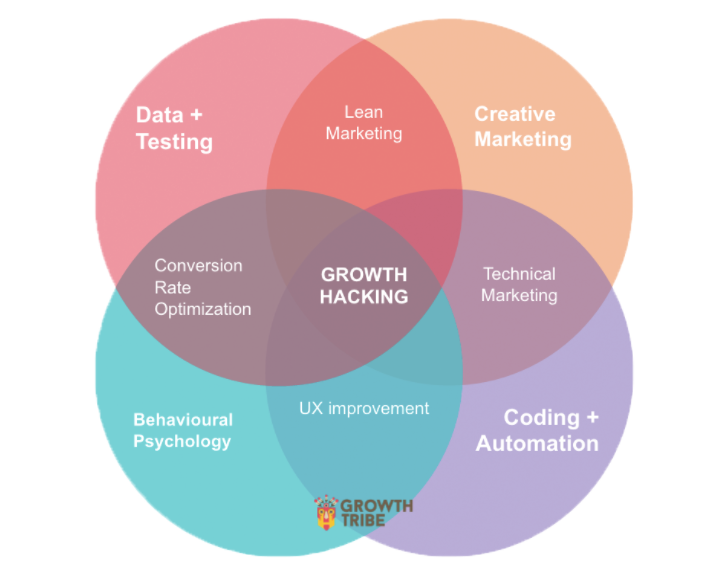 People with these skills, the right mindset, and a suitable process are a rare breed called Growth Hackers (or growth marketers or technical marketers if you will…it’s all about the buzz). Whatever you call them they are RELEVANT to today’s tech and data-driven world. The skills necessary to be relevant can be summed in what we call the T-Shaped Marketer. You could also call it the T-Shaped Product Owner or the T-Shaped Founder. For the past 2 years we’ve helped explain the importance of data-driven marketing based on rapid experimentation and trained T-shaped marketers. 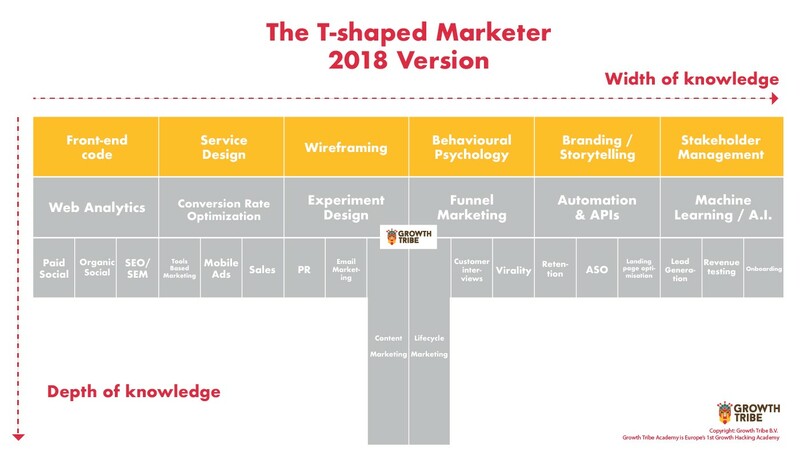 As T-shaped marketers have become a company’s secret weapon and as technology changes daily the skillset of a T-shape evolves over time. 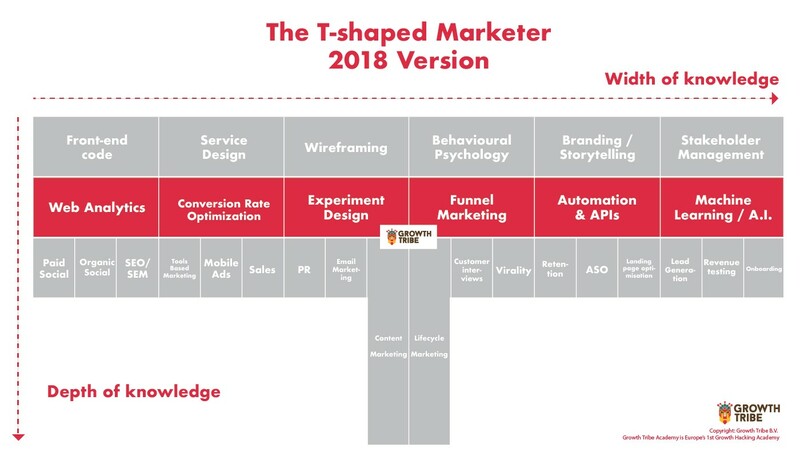 Here is the new version of the T-shaped marketer. 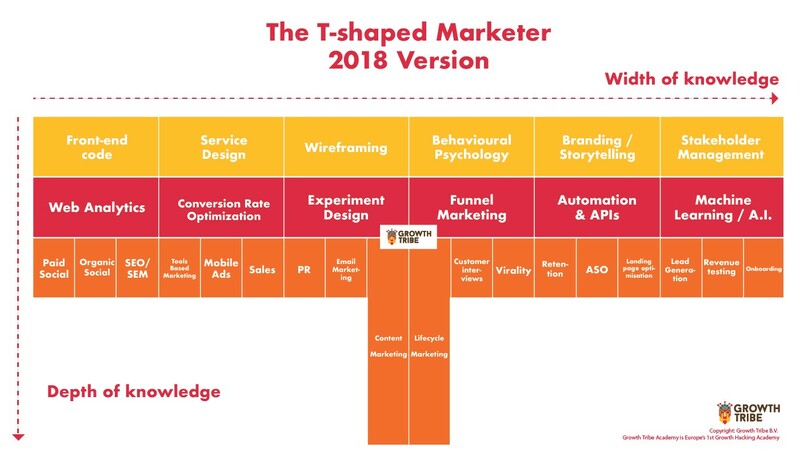 Then, in came the T-shaped Marketer. We were greatly inspired by Brian Balfour in 2015 who applied the T-shape to marketing. Ever since then we’ve made it part of our DNA and made it our own. This is not just for startups, it’s also for corporates. Because as today’s mostly agile and multi-disciplinary cultures aim at cross-disciplinary teams, speed, flexibility and the ability to exchange roles with others, the T-shaped player is ever more POWERFUL, ever more VITAL. As technology and the digital landscape evolve daily so does the profile of a T-shape marketer. So we updated it from our 2016–2017 version. We’ll do this every year from now on. The first level are the skills you need an intuitive understanding of. When’s the last time you committed a line of front end code? As consumers get bombarded with options and experiences, Service design teaches how to build products people actually need and want. Having customer empathy, understanding real pains to be solved, understanding customer journeys and building solutions that solve those pains. When was the last time you mapped out a customer journey? As growth marketers are increasingly involved with the full customer journey (and not just driving traffic to a product) it’s important for them to be able to design and wireframe customer flows. Some usual suspects are wireframing new on-boarding flows, new features, referral programmes or checkout flows. How many user flows, features, campaigns or apps have you wireframed…ever? A growth marketer is a mind reader. She/he must understand the customer.. What are their pains? What are their behaviours? What type of personality do they have? What will make them convert? Researchers like Cialdini, Dan Ariely, Nir Eyal (Hooked), Sandra Matz and Thaler & Sunstein have paved the way. It’s now up to you to apply these learnings to your businesses and discuss them with confidence. When is the last time you’ve knowingly implemented loss aversion, reciprocity, social proof or any other persuasion technique? Branding is one of the 3 most powerful weapons against completion (along with Embedding and Proprietary technology. As a growth marketer you must understand the implications of your experiment on the culture and on the brand of your company. Long seen as a blocker to rapid experimentation, branding and storytelling are now seen as an asset that can help open hearts and wallets. The importance of branding varies great. Have you ever created or used a brand manual? As your organisation grows bigger you start to step on more people’s toes when running experiments. It starts with product teams, then sales teams, then customer success teams… then when you reach corporate size organisations your experiments are overlapping with everyone: Branding, Marketing, Agencies, Compliance, Risk, Governance, Legal to name a few. Stakeholder skills (usually soft skills) allow you to navigate the complex world of getting your experiments through the door and the bosses happy. When’s the last time you needed to convince people about an experiment you wanted to run even though they had no personal incentive to help you or let you run it? The next level are skills you need a deep understanding of as well as some practical hands-on experience. You can’t manage what you can’t measure. So you definitely need a deep understand of how to track customers on your digital product or service. This includes tracking, analyzing and visualizing data to find out WHAT is happening on your site and WHERE to optimize. Have you ever set up conversion tracking yourself? Often wrongfully referred to as simply AB-Testing, CRO is the art of converting more visitors along the sales funnel. It’s a mix of psychology, statistics and front-end changes. Having an experiment driven approach means you need to… well… design experiments of course. Experiment design is an art as much as it is a science. We believe that 90% of your experiments should not last more than 2 weeks. How many experiments have you designed and was it an experiment following a hypothesis, a description, what you’ll track, some success criteria, results and next steps? Dave McClure developed his Pirate Metrics in 2007. A simple, adaptable KPI framework that can fit almost any business model and/or product. We see it as the first step to being data-driven. It’s important to track customers end to end on their journey and clearly define what we consider a conversion from one step to the next. We’ve adapted the original pirate funnel to make it more flexible but the fundamentals stay the same. What are the 5–6 steps of the pirate funnel? As the amount of available tools grows exponentially, knowing how to leverage automation with code or with tools like Zapier & IFTTT as well as knowing how to link multiple apps together by leveraging their APIs can help one person work like 10. Even if you don’t know how to set up the automations yourself, it’s vital to at the very least understand how APIs work, what their limitations are and how they can help you automate repetitive and/or large tasks. When is the last time you created an automation rule OR when is the last time you made an API call? Being in the top 1% of growth experts for the the past 20–30 years required knowing how to leverage humans and technology. We believe that the next 10–20 years will be about knowing how to leverage humans, technology AND machine learning. What questions can machine learning answer? How can it improve the quality of your assumptions? How can it help predict outcomes? What are the different supervised and unsupervised applications of machine learning? Are all questions you should able to answer. Check out this piece we’ve written that explains why “proficient in machine learning” is and will increasingly be a must-have on your resume. What are the marketing and growth applications of supervised and unsupervised machine learning? These are customer acquisition channels. 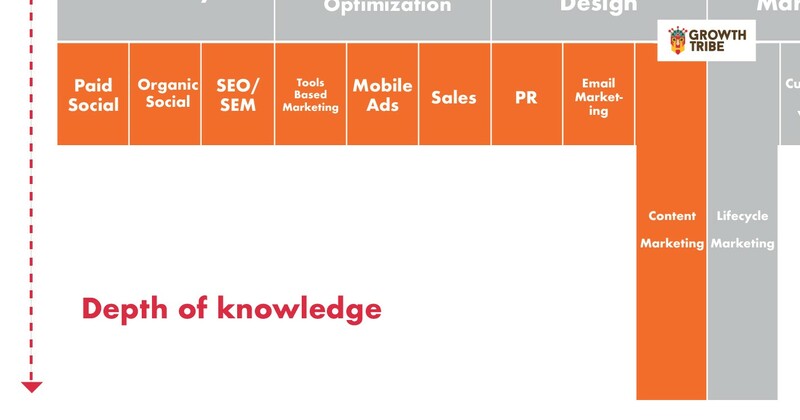 As a T-shaped marketer you need a deep, hands-on, critical and up-to-date understanding of these channels. You’re usually an expert in one or two of them. Paid ads on social networks changes almost weekly. More networks, changing interfaces, changes customer interaction and changes in competition. Facebook offers new formats, Google Display Network CTRs are dropping, are you running Snapchat ads? Would Instagram work for us? Should we pay for influencer marketing? Are Reddit native ads a good deal? Did you know Instagram offers new ad formats, Buzzfeed offers native promotional articles, what next?? A deep knowledge is necessary of these channels and how they evolve over time. How many ads and on how many platforms have you run social ads? The social network landscape evolves rapidly. Some channels like Facebook have almost no organic reach. You have to “pay to play”. Other channels still have strong organic reach. Which are these channels and what type of content and distribution strategies allow us to appear highest in their algorithms? When was the last time you made a post that got some serious organic reach? Will search ever NOT BE the best traffic source? Search = intent = I want to buy. SEO and SEM have been and remain some of the most powerful and ROI-effective customer acquisition channels. Yes they are ever-changing and rather complex. When’s the last time you ranked in the top 3 positions for a keyword? Also referred to as “Engineered as marketing”. This refers to building small free apps or tools to generate leads. Here’s one of our favorite examples: http://howmuchtomakeanapp.com/. Teams we’ve trained have used this channel very effectively. It requires a strong mix of design, code, creativity, virality and tracking to work. The questionnaire you are taking right now is a small example of tools based marketing. Have you ever built a mini app to generate leads? Global mobile usage surpassed desktop usage around 2014. You need to master skills related to mobile advertising. The Importance of Context on mobile is essential. Context and location in particular are powerful to mobile advertisers because of the unique nature of the platform and, most importantly, the personal experience of using a mobile device. Have you ever purchased mobile ads or used a mobile ad platform? Sales people and sales teams take leads, remove blockers to purchase and sell products. Doesn’t sound too different from marketing does it. Yes sales is an art as much as a science. “Getting to yes”, “objection handling”, cold outreach, predictable revenue are all notions that a T-shaped player MUST understand if he or she is in a company with a sales cycle longer than a day. A strong understanding of sales and sales psychology is a must. What does A.B.C stand for? How do you get coverage from traditional media like online magazines, newspapers, radio or TV? How do you pull off unconventional PR like guest blogging or PR stunts? Is influencer marketing the future of PR? When’s the last time you got a press mention? Email marketing is still one of the highest ROI channels. It’s also a fast-changing channel as people’s behaviours change and as inboxes change their rules. Building email lists, cold emailing, lifecycle emailing, transactional emailing, newsletters… the world of email marketing is large and complex. How many email campaigns have you created and tested? This is the most popular form of inbound marketing. Blogs, videos, infographics, podcasts, white papers, email courses, memes, GIFs, how-to’s, listicles, games, quizzes, academies, slide decks… what type of content are you creating and more importantly how are you distributing it? How many pieces of content have you created and distributed in the last year? This is yet another difference between marketing and growth. This section shows the skills necessary to activate, retain and convert prospects from simple visitors to loyal customers. This is usually where UX and marketing meet. It’s no longer enough to simply drive traffic to websites and products. You now have to acquire them, activate them, convert them, retain them and get them to invite others. 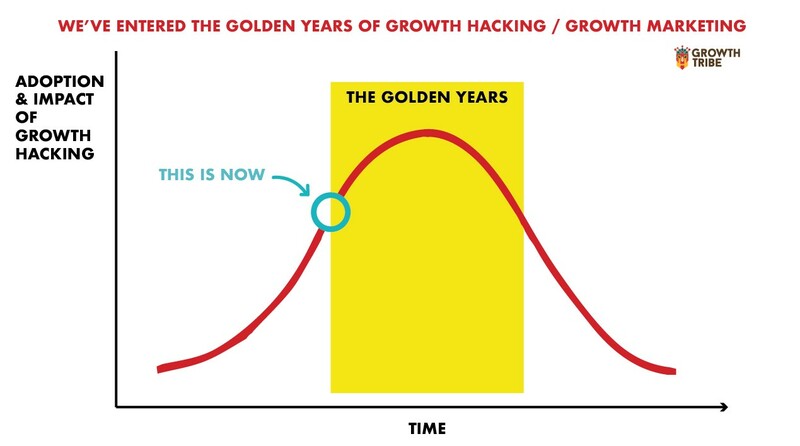 This is where the line between marketing and product dissolves to create a new area called “growth”. Knowing the right mental models on how to track and convert users through this journey is what we call lifecycle marketing. What are the different steps of your customer’s lifecycle? Hard metrics tell us WHAT happened with a campaign or an experiment. SOFT data (qualitative data) tells us WHY it happened. There is actually a science to collecting ACCURATE qualitative data. Whether it’s online or offline, we group these techniques and best practices under the name of customer interviews. Virality is calculated with the “K-factor” (a.k.a “viral coefficient”). At it’s simplest level it’s the number of new users or customers than a customer bring in. You have positive virality when one new customer brings in 1 or more customers. It then spreads like a virus. The key is knowing what to measure, how to measure it and how to incentivise referrals. Do you know what a dual incentive referral scheme is? Do you know how to calculate a viral coefficient? For many business models like subscription models, freemiums, media websites, marketplaces, loyal e-commerce, user generated content websites or apps. Retention is king. The business model doesn’t work unless you know how to diagnose, track and improve daily, weekly, monthly and/or quarterly active usage. Do you know how to read a retention chart? Mobile has eaten the world. Therefore the 2 biggest mobile app platforms Google play store and the Apple iTunes store should not be a secret to the T-shaped player. How do you optimize for each app store, what are the main differences between the two and how do their algorithms work? What are the top 3 things to optimize on an app store page in order to increase downloads? Landing page optimisation includes things like conversion centric design, conversion copywriting, building correct attention ratios, usability testing and A/B testing. Landing pages are usually one of the first contact points of a customer with your service or product. It’s usually the moment where you win them over or lose them forever. When is the last time you ran an AB test on a landing page? Sometimes people won’t buy on their first visit. You need to gather them as leads and then nurture them into paying customers. The art of lead generation is one of creating value and grabbing personal details in exchange. What do we mean by “lead magnet”? Too many companies simply GUESS what their price should be rather than testing it iteratively. Yes simple tests could double your revenue. Should you ask your customers? Should you split test? Can you find the answer from desk research? How do you measure you products’ or services’ WOW moment? How are your T-Shape Marketing Skills?